Did you know that you spend one-third of your life in your bedroom? Your bedroom can affect your mood, outlook, and, sometimes, how you spend the rest of the day after waking up. Because it plays such an important role in your life, the bedroom is a special space in the house. You need to pay attention to it and decorate it in a way that will bring the most benefit to your life. You don’t have to hire an artist to decorate your room, or spend thousands of dollars to make your bedroom beautiful. You may, however, need to brainstorm to come up with something unique and personal. In this post, you can tap into the creativity of the artist and be inspired to create a beautiful living space. There are many places you can get inspiration for your bedroom and the décor that fits your style and tastes. 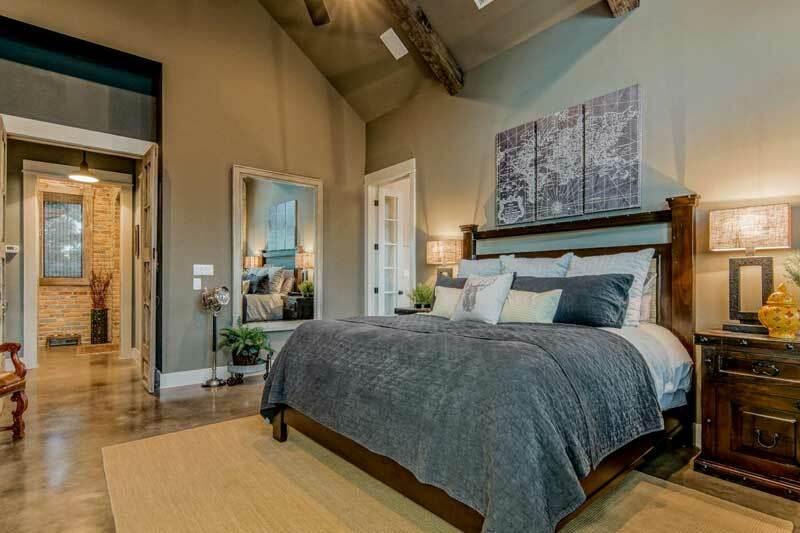 You can choose from traditional, rustic, or modern settings for your master suite. Depending on your budget and taste, you can choose from plush pillows, soothing colors, comfortable bedding, extraordinarily crafted wall art, and luxurious furniture. There are many reasons you may want to decorate your bedroom. You might want to make your bedroom the perfect area for coming up with new ideas for your company or business. Or, you may want your bedroom to be a serene environment that is free from the everyday commotion. Fortunately, there are many – not just one – décor styles and designs that can work for you. If done right, decorating your room can affect your life in a positive way. In this article, I want to introduce you to fifty beautiful, inspiring spaces. Follow me as I take you through bedroom decorating ideas and tips, so that you will be able to make the most of your space. In this setting, you can see simplicity at its best. 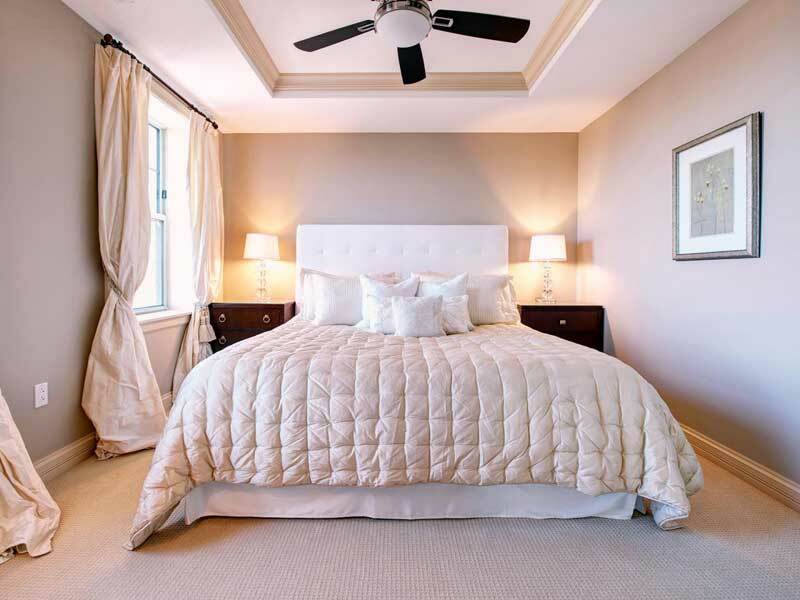 There is plenty of light coming from outside, which is in perfect harmony with the color of the bedroom. The plants add life and character to space, and the rug picks up the brown accents, creating a contrast with the dominant white. 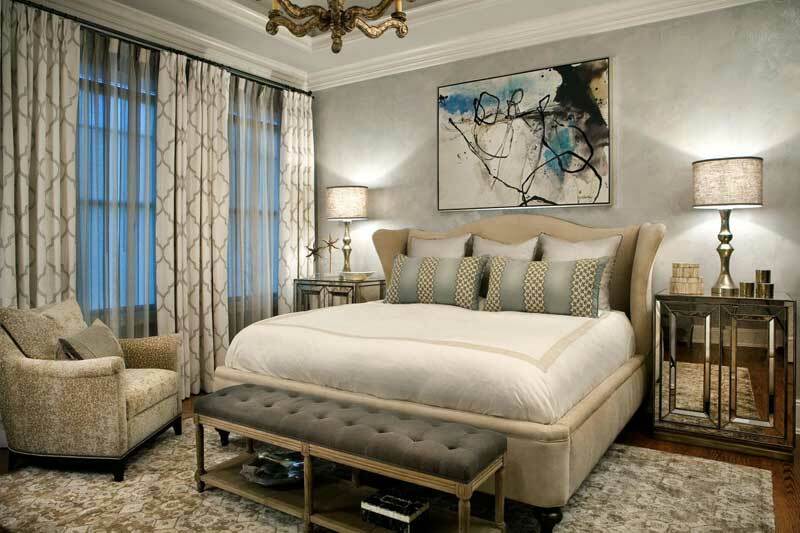 When designing your bedroom, you can have a wall portrait for added effect, as in this décor. 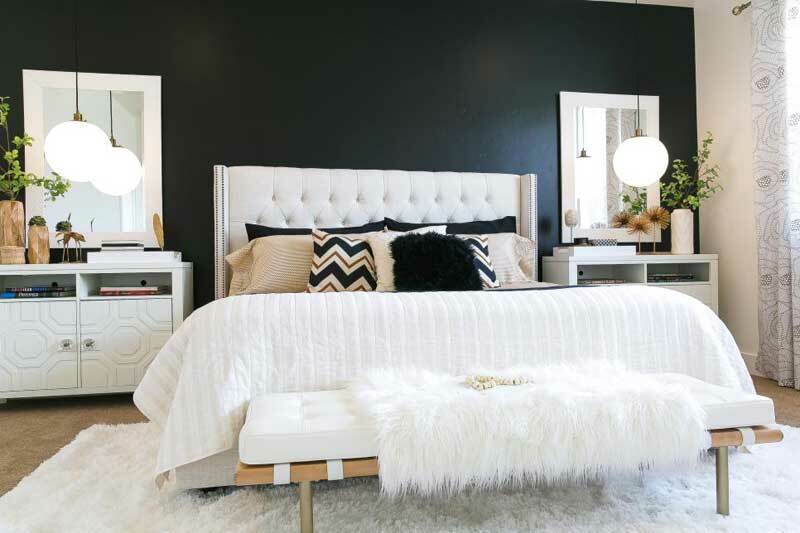 There is a lot of contrast here, which strengthens the texture of this creative bedroom. While the green wall seems to be the dominant feature here, you can see that the white curtains also stand out. The armchair on the left-hand side matches the color on the bed. The paintings hanging above the armchair add color to the more subtly-colored wall. When you look at this room, the first thing you notice is the bright white bedding. There is a lot of lighting here, thanks to the two big windows on either side of the bed. 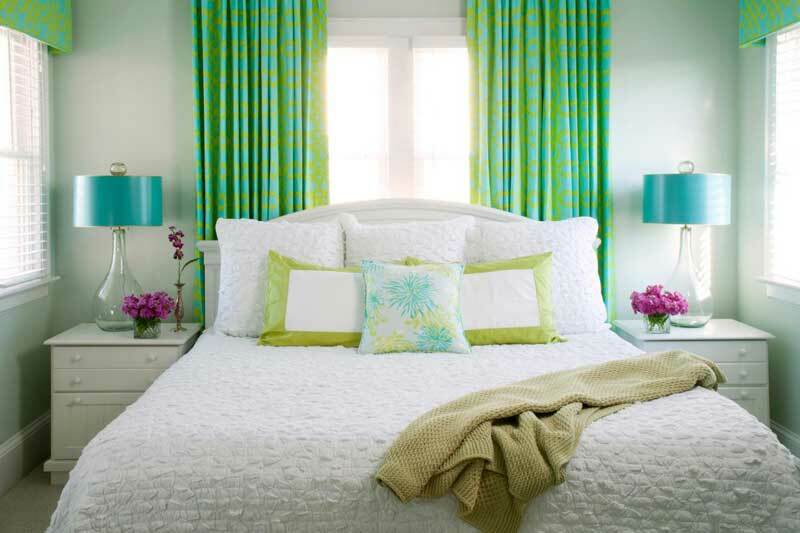 The beauty of this room is further enhanced by the lime green window curtains – even though the curtains are the only items in this color, the whole room would be rather bland without them. 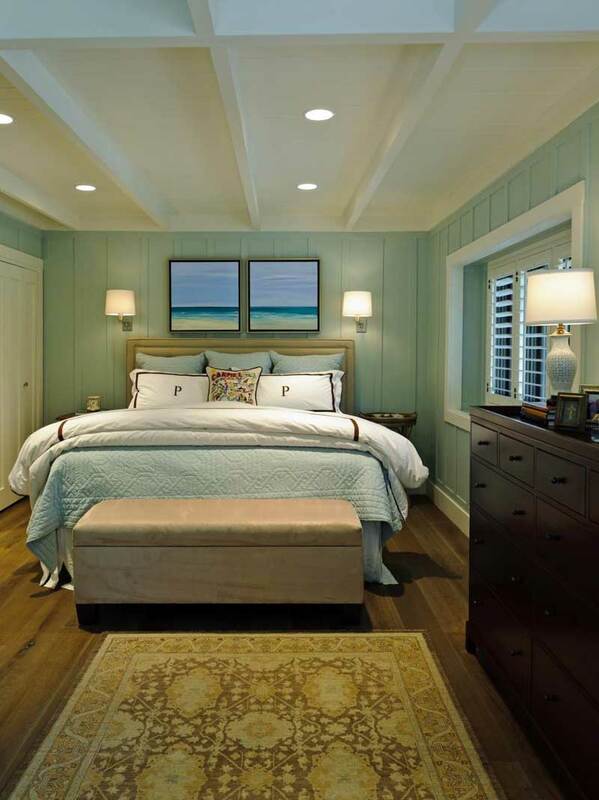 This stunning coastal-inspired bedroom is simple, though elegant. Everything in it comes together to create this overall impression. The lighting, for example, is spread out across the room. The walls are painted sea green, and the room evokes the interior of a luxurious vintage train cabin. The cream rectangular table at the foot of the bed is not only practical but also matches the rug in the bedroom. Although this room is small, it has an element of beauty flowing through it. It is warm, inviting, and luxurious. The brown color palette used is spot-on. The mirror above the pillows also adds an element of elegance to the room. If you want to design this kind of bedroom, you need to consider the lighting, ambiance, and, most importantly, the color palette. 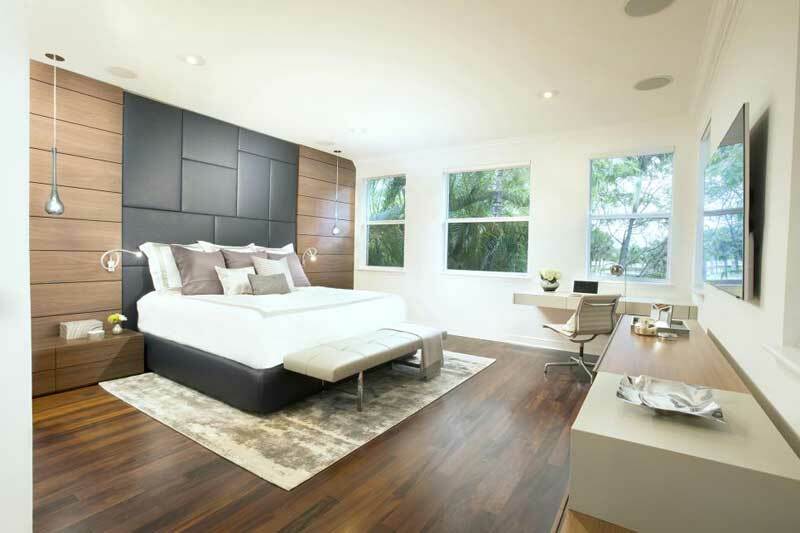 One of the essential elements characterizing modern bedrooms is space and simplicity. This spacious, well-lit room has enough space for a couple. Unlike in traditional layouts, where there is just a bed and maybe a small table in the room, there are more items here, but the room remains uncluttered. The sofa on the right and the cupboard on the left do not obstruct the overall design. 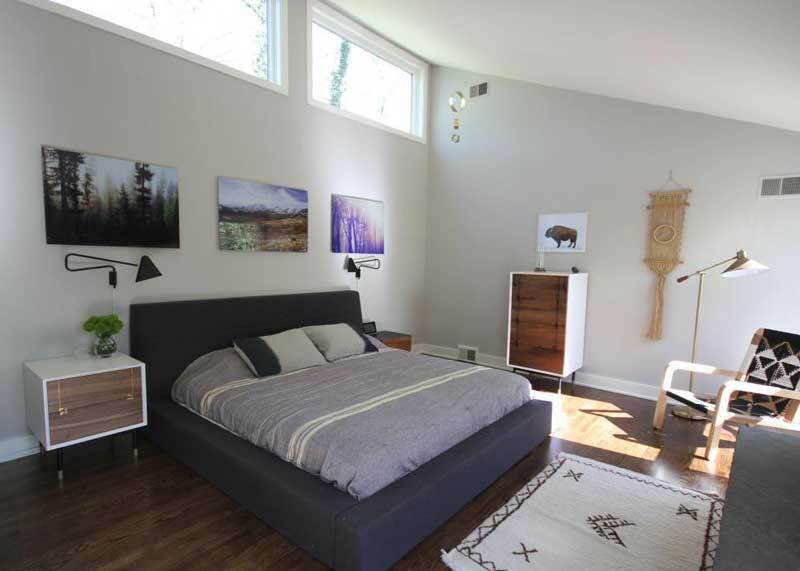 This bedroom contains the right combination of items, all properly arranged, to produce a cool, airy environment. The stylish interior, which would be ideal for a couple or someone living alone, features innovative lighting, contrasting tones, and green touches. The color palette used is neither dull nor overly crisp; rather, it’s just right. This is a small bedroom that may be suitable for an individual. The tones are elegant but neutral. Beside the bed, you can see a moveable table with a lamp and a few items stored under the table. Although it seems like a small detail, it can be very handy for a busy person. You can store documents or books here, to do some quick bedtime reading. Blue is always beautiful, and it is widely used in traditional and modern bedrooms. In this setting, the blue is enhanced with brown accents – from the table on the left to the window dressings. When you are designing your room, don’t forget about the windows and walls, as you can achieve a lot with them. In this room, three frames add visual interest to the walls. This elegant, rustic-inspired room offers sweeping outdoors vistas of the beautiful nature right outside. Large windows let in ample light, and the decor is a mix of plush accents and country-chic architectural details, including exposed wooden beams. The color scheme complements the natural shades and creates a space that is both inviting and cool. 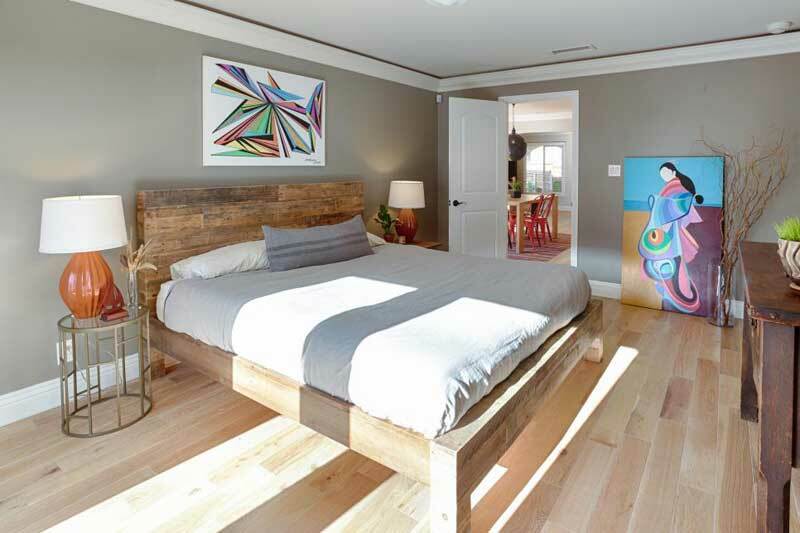 This bedroom evokes a trendy, modern studio. The wood paneling serves as a design accent, but can also be customized to fit different styles and decoration. You can see stacks of books on either side of the bed, and accompanying desk lamps. If you and your partner love reading, but don’t like leaving books far away, you can share a library right here in your bedroom. This is a room full of masterful touches. The bed is beautifully decorated, and the fan is just the right color and shape. 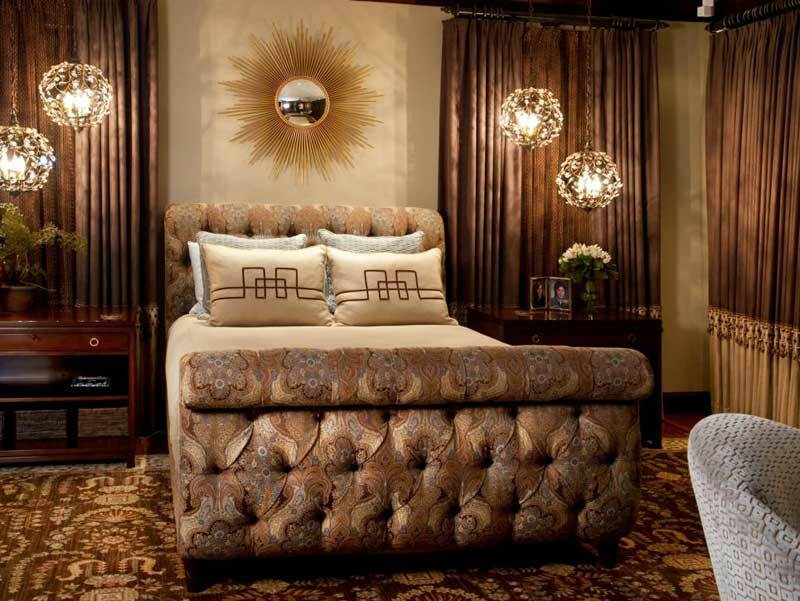 The lights on each side of the bed provide subtle lighting, and the wall hangings complete the look. If brown had been the only color used, the decorations would have been heavy. However, see how another color (white) is infused throughout the dominant brown design, lending warmth and contrast. Decorating a room that gets compliments just right is not easy, but this bedroom manages to do it perfectly. There is just enough recessed lighting for when it’s dark, and large windows for when it’s day. The color palette and contrast are beautiful. The stylish chair adds color to the design and serves as a unique focal point in the room. This is another design for a book lover. It features bedside tables to hold books and two table lamps for reading. 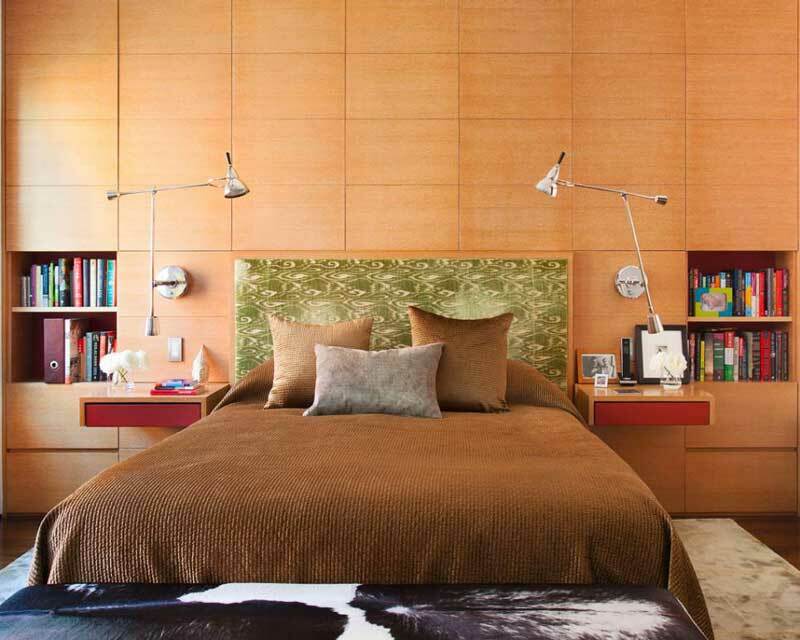 Red, a tricky color, is used sparingly, but boldly, in this modern bedroom. Here, it is beautiful and trendy. Since it is matched with brown and cream, it is not overpowering, but instead, brightens the room. Pink bedding is a bold choice, and can be tricky. In this room, however, the color is vibrant and attractive, because it provides contrast. As you can see here, the dominant color here is cream, and the introduction of red – from the curtain – equalizes things. Although this room looks bare, the addition of wall hangings and golden lamps keeps things from getting boring. If you are decorating your room, you may be tempted to go for simple white. Adding another color to it can then become daunting. In this case, the designer totally nailed it. The white and gray integrate beautifully together, and also help highlight the other colors. The light accents on the gray wall are beautiful and elegant. 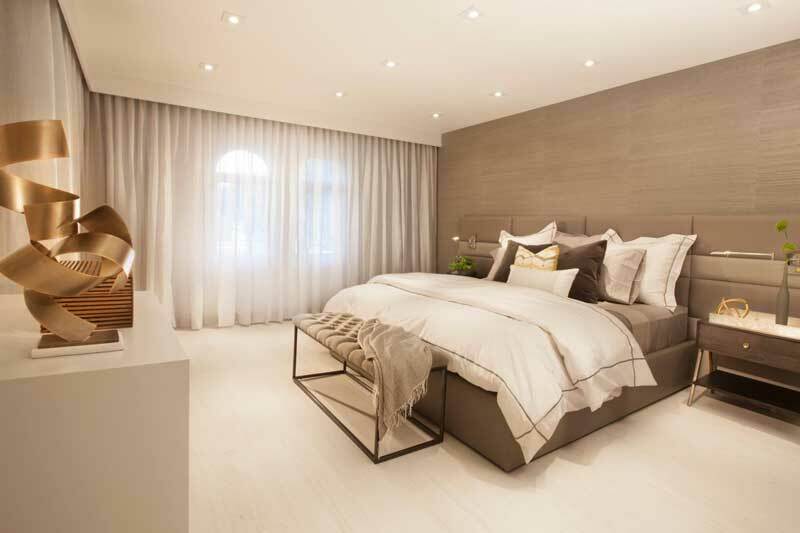 If you want to create a contemporary master bedroom, don’t spend too much time thinking about what to do with the extra space. Spend more time thinking instead about the feeling you want the room to provoke. If you get that right, the extra space will be transformed into a thing of beauty, as in this master room. The smooth wooden floor meshes with the beige color on the ceiling and walls, creating a cool, inviting atmosphere. This is a classic bedroom with abundant light and color contrast. You can add variety and style to your bedroom by following the example in this room. It seems the designer here is eager to draw you to different items in the setting. The single armchair at the left-hand side has a table lamp to it, and can see table lamps on either side of the bed too. 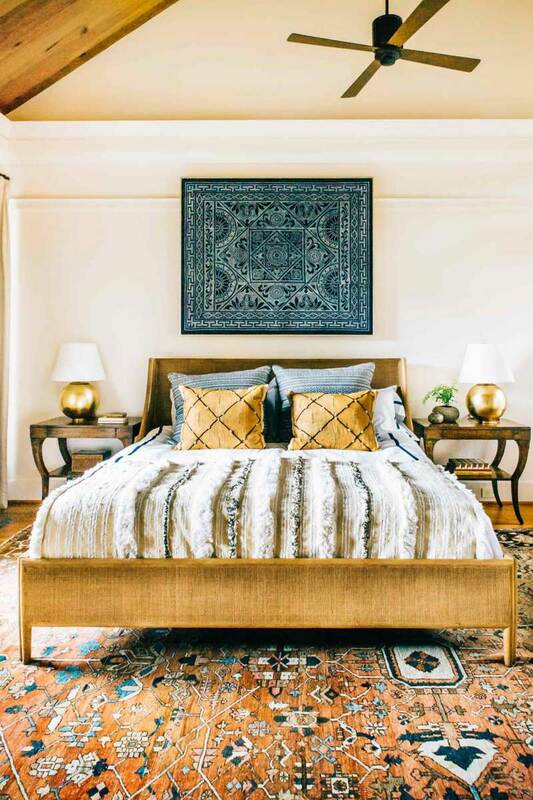 If you don’t have a particularly impressive headboard, you can replace it with a piece of artwork above the bed that provides continuity and visual interest. You can count the items in this bedroom, which says a lot about how it is laid out. 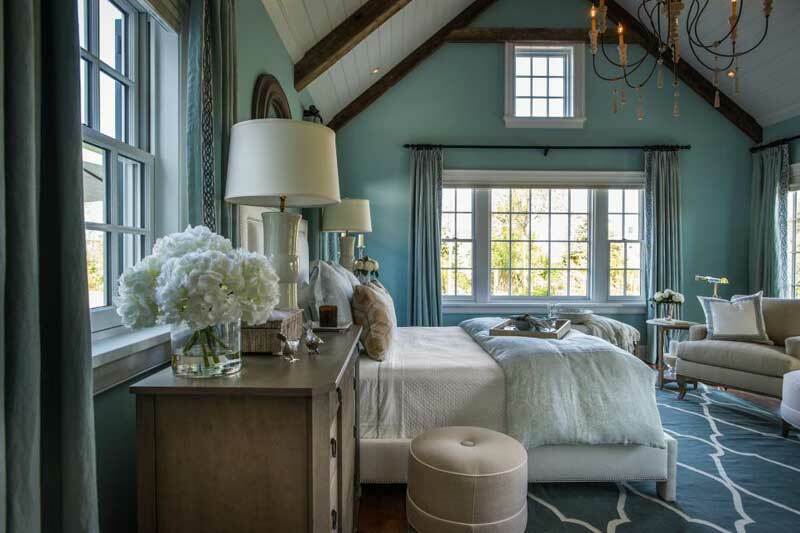 The colors are crisp and fresh, and the aqua blues evoke a coastal retreat. 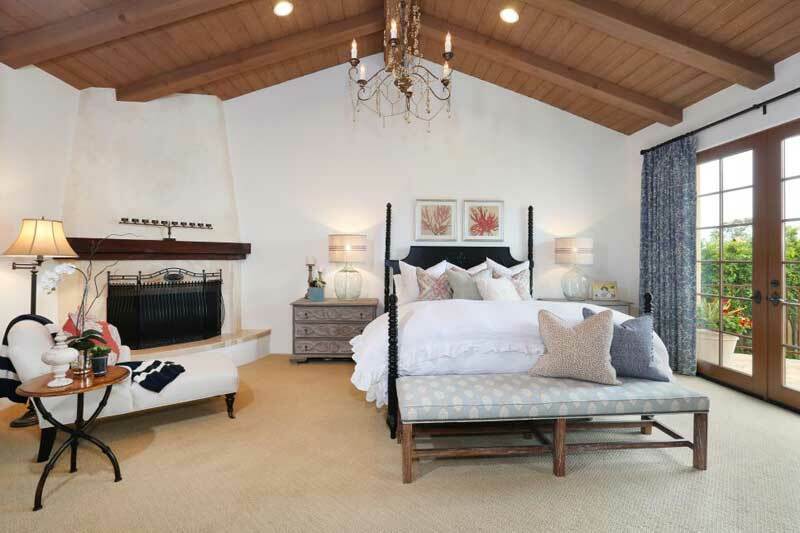 This room contains an eye-catching carpet, beautiful pillows and linens, artwork above the headboard, and unique lamps. 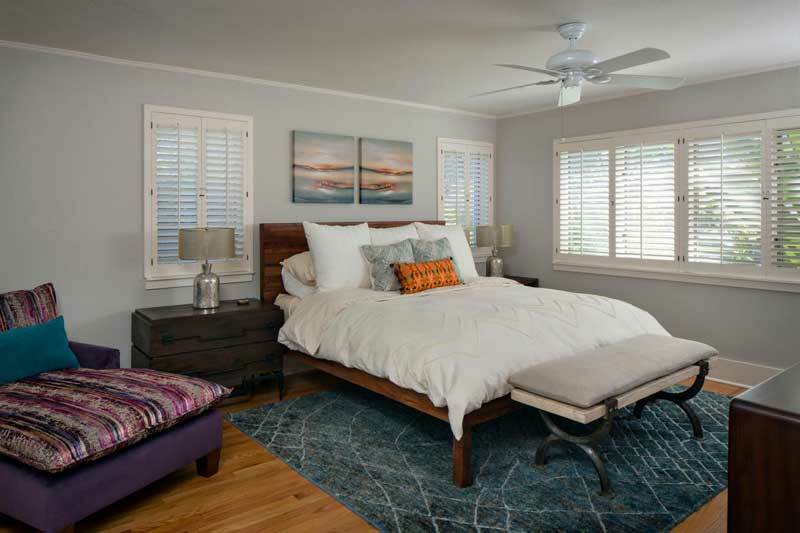 Although the ceiling fan appears to be a different style, you can still achieve a classic look with something unique like the one used in this bedroom. The blue art is the only item that stands out here, adding variety to the room. This room is cool, spacious, and well lit. If you want to achieve this kind of look, you have to look beyond the items in the room to the color scheme and mix of lighting concepts used. You don’t have to think too much; just replicate the concept used here, and you will be good to go. Turn your dull bedroom into a smart space with white paper lanterns. The lanterns in this room are strategically placed, slowly leading your eyes from the big brown piano stand to other parts of the room. You can also play with different color paints on the wall to ensure the room looks vibrant and interesting, as in this model bedroom. 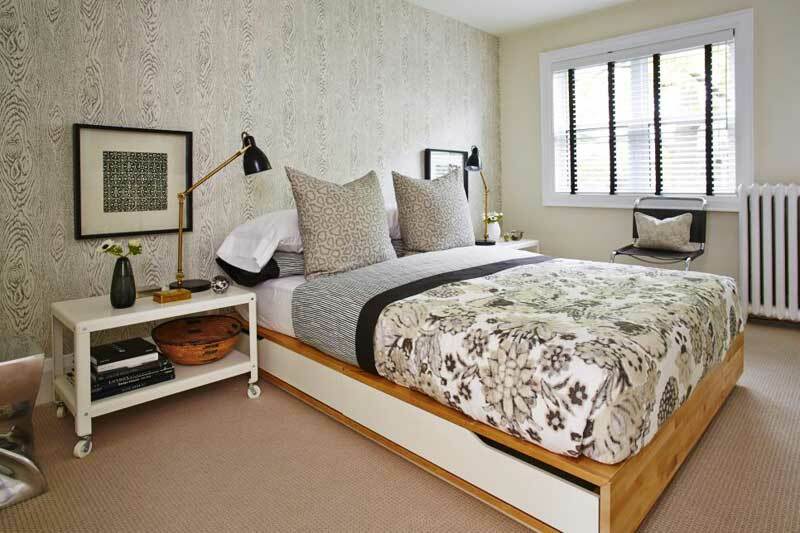 This bedroom is simple, and it shows what you can achieve with a simple wood shutter. Add color and elegance to your bedroom by changing the look of your headboard. If you want, you can also incorporate this element to different parts of the room. 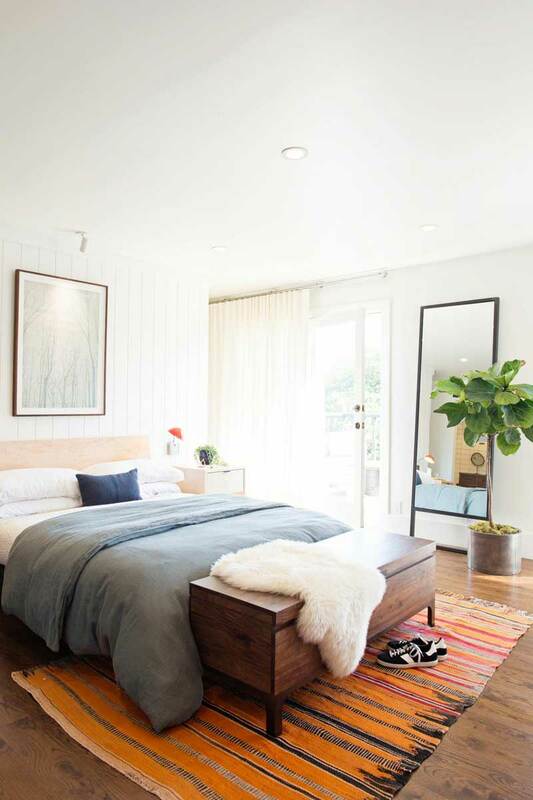 In this room, adding a wooden nightstand provides visual continuity to the stunning headboard. When you are decorating your room, don’t think only about the walls, tables, or rug. Also consider what you can achieve with a bold chandelier, which can completely transform a space, as you can see in this room. The contemporary-style brass chandelier is wide and open, spreading light to all the nooks and crannies of the room. The rug in this room is well laid out, and the room will never suffer from a lack of light, thanks to the large windows. If you want to achieve the same result, use sheer curtains. This room is painted beige but decorated with many colors. This adds variety, an effect you can easily replicate in your room. 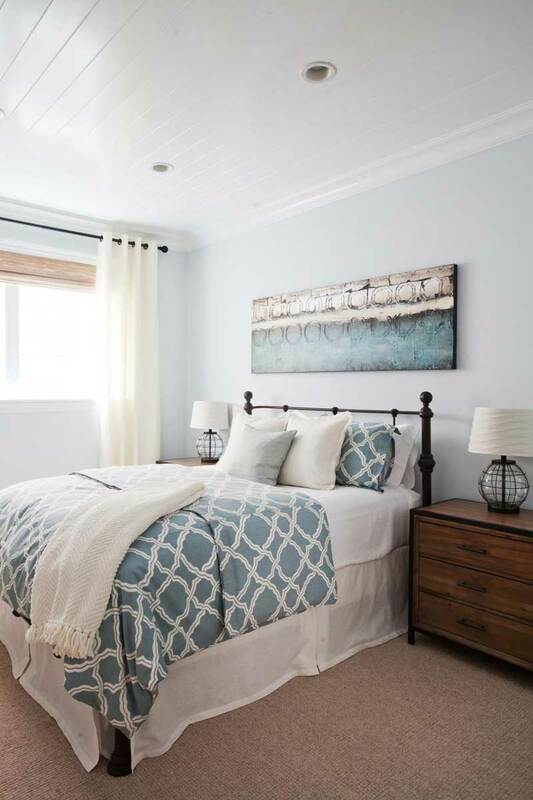 In this bedroom, you can see that the color white prevails, and the blue is muted. 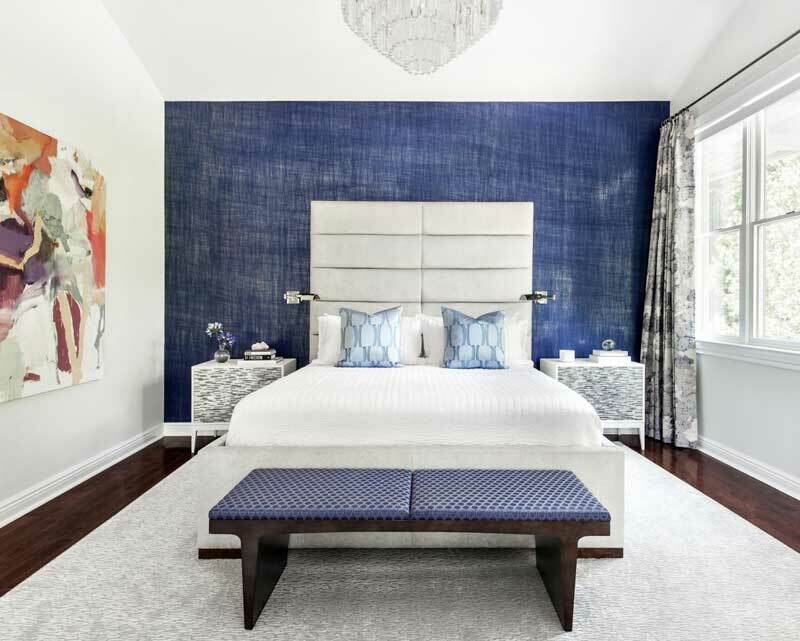 If you don’t like blue, try using another color, such as brown or purple to match a piece, such as the small bedside table on the left in this bedroom. It wouldn’t take away the beauty of the room. The large window on the right also brings a vibrant outdoor view. You can achieve a lot when you decorate your bedroom. It can not only become a beautiful space but have useful applications as well. Here, the bedding is simple, but other pieces, such as the armchair, are practical and also add a plush, elegant feel. The wall painting also adds additional color to the room, which is already full of dramatic touches. 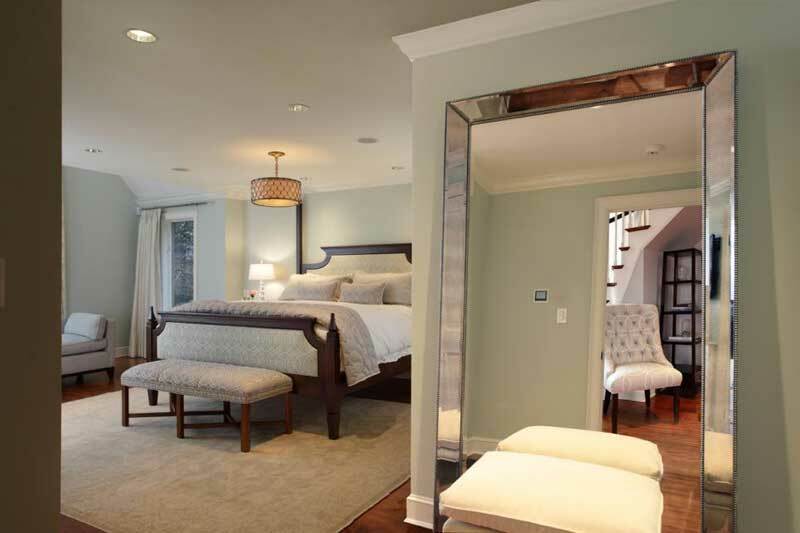 The mirror in your bedroom can serve more than one purpose. Instead of placing it above the headboard, you can add somewhere where it faces the exit door of your room. This way, you can not only see your reflection whenever you want, but also monitor your children, and be more alert to what is happening in adjacent rooms. Adding a design element above the headboard can make a huge difference in your room. 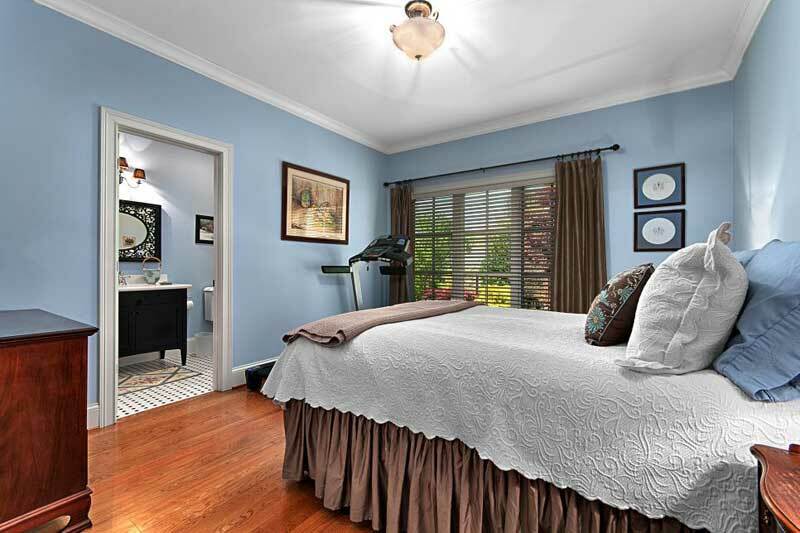 Make sure it matches the existing color scheme, as seen in this bedroom. Other decorations could be as simple as adding a chair with pillows of different colors that match those on the bed, as seen here. This space also has large windows and an attractive dresser. 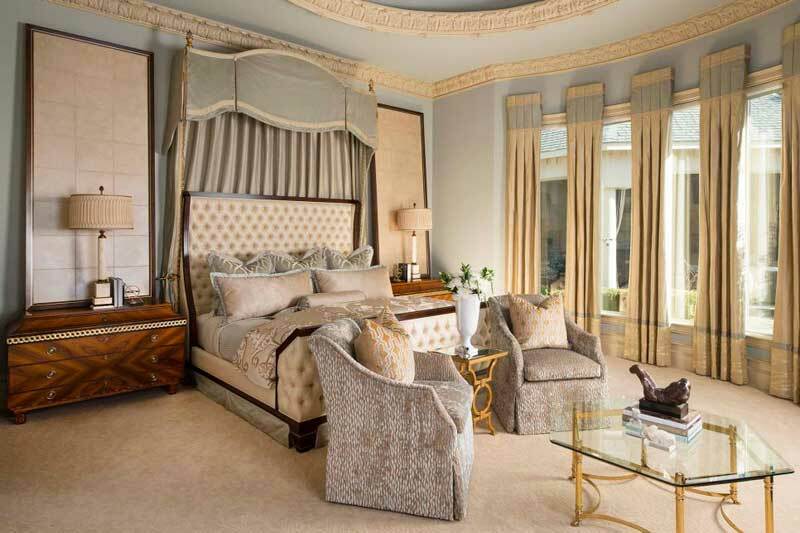 This is a classic example of a bedroom that achieves excellent results by mixing many items and styles. The large overhead windows bring in a lot of light, and the wall hangings above the headboard bring in continuity and a natural touch. 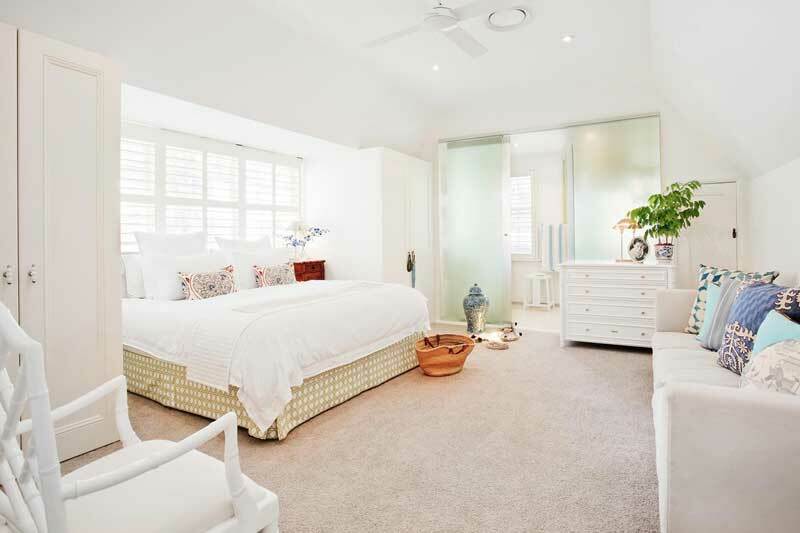 The small white rug on the floor is minimal but still adds design and texture to space. This is a perfect setting for a nature lover. You can maintain the overall simplicity of your bedroom while introducing some element of nature into your bedroom. Notice that the brown accent wall and the matching floor go perfectly with the views of the plants and trees from the surrounding windows, but still, look modern and minimal. This room looks classy and elegant, yet is simple and not overdone. It achieves the perfect balance between modern design and nature-inspired colors. Take in the outdoor views, while remaining in a comfortable, beautiful space. A bold aquamarine accent wall serves as a headboard, while also brightening the room and adding a splash of complementary color. 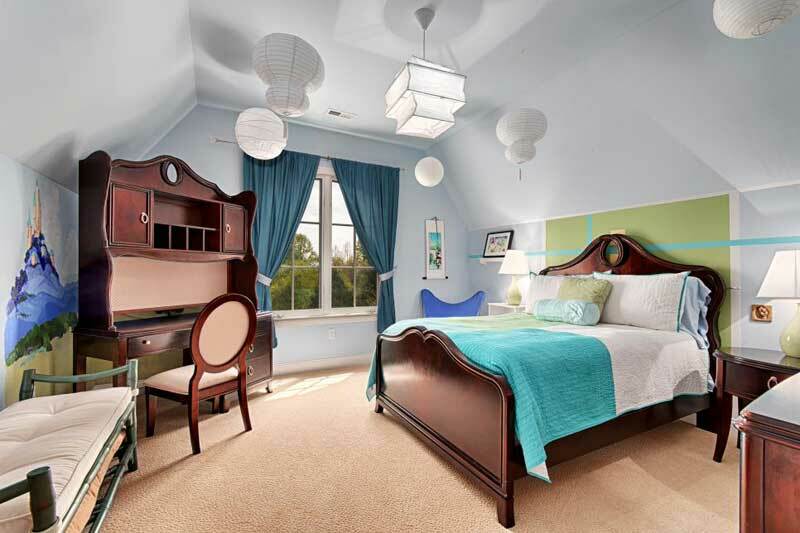 Fortunately, redesigning your room can be as simple as repainting and adding a few items. This room is simple and contains a minimal number of items so it would be straightforward to replicate. 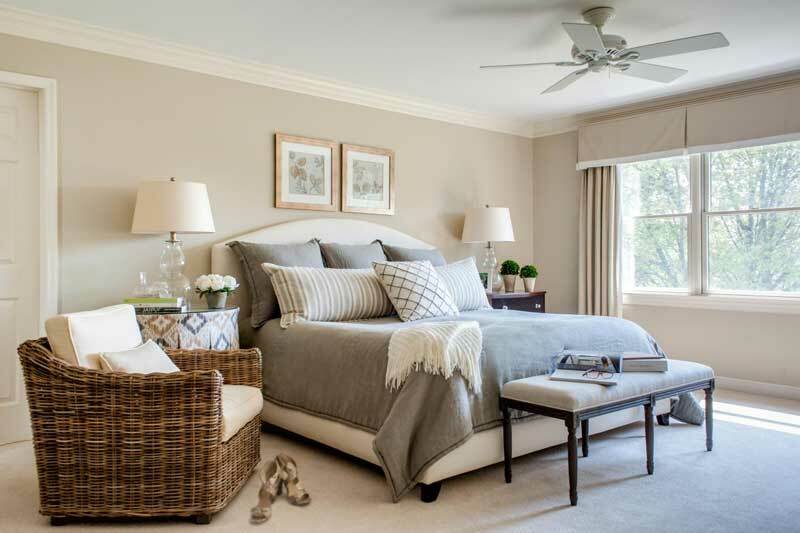 The gray accents are beautiful, and nothing in this space is dull – from the large windows and lights to the piece at the foot of the bed. This space evokes a lounge, where you can luxuriously stay in bed and watch TV. The black inset television is directly facing the bed so that you can get a clear view from your bed. The room is bold, elegant, and spacious – a perfect fit if you have a large family. Quickly bring in a few additional chairs, and the entire family will love hanging out here. 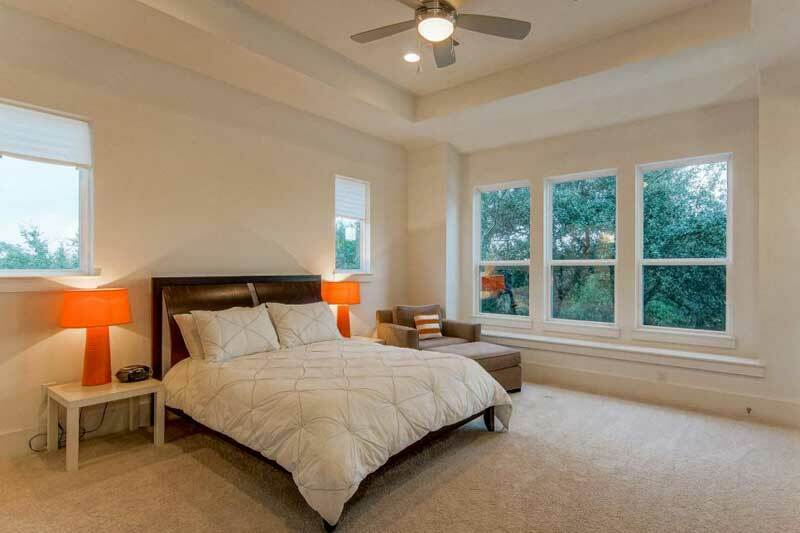 One thing that is now common with modern bedrooms is to have expansive windows and a very large, open space. In this setting, the bright bedside lamps are particularly striking, and they beautifully contrast with the large windows and outdoor views. Simple lines and a muted color scheme complement the bright touches and natural landscapes. 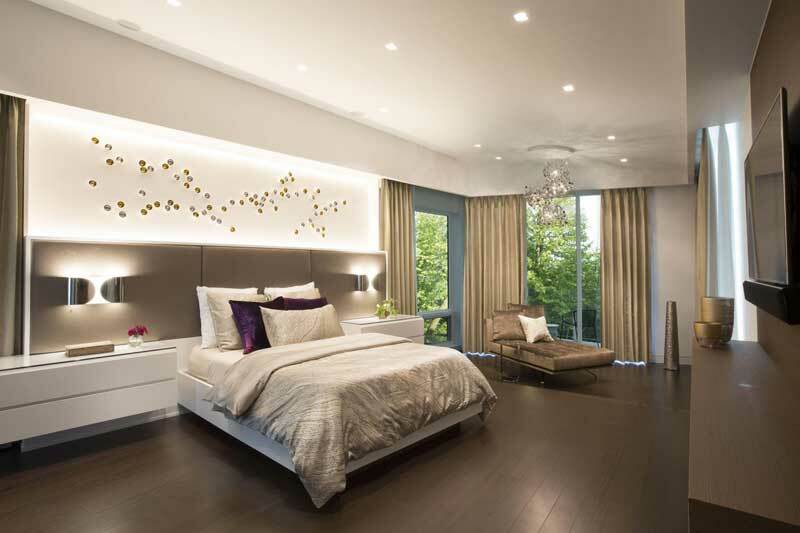 Modern bedrooms are furnished with various materials that add beauty to their look. If you want to decorate your room, you have to think about contrast, accents, color palette and how to match everything to bring out the best of your room. 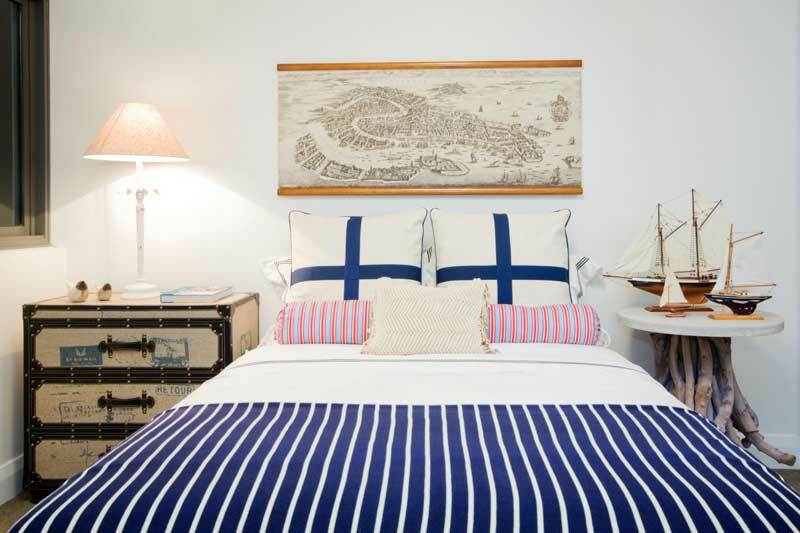 This coastal-inspired bedroom brings together unique nautical pieces with bold striped linens. Everything is carefully considered and contributes to the overall look. The brown armchair on the left in this room is woven from simple materials, and it is decorated with soft pillows that match those on the bed. The wall has two paintings that complement its color. The color on the ceiling fan matches the bed sheet, and the large windows ensure there is enough light to keep the room vibrant and airy. This room is a reminiscence of an artist’s lounge – simplicity and style will always lead to a finely decorated room. Where the creativity of an artist meshes with simple rustic wooden pieces, you can see gray carefully worked in throughout the décor. If you want to enjoy the same look in your room, add a few similar paintings and accents. 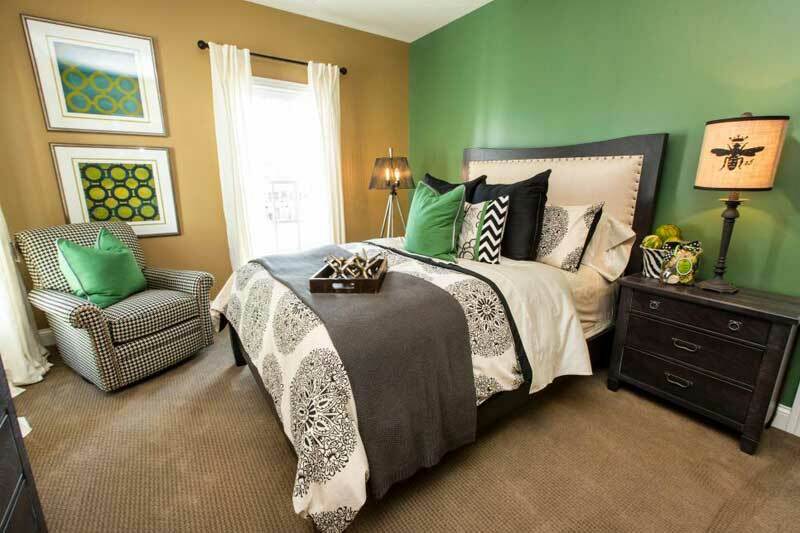 Use green with any color in your room (except black) for a unique look. In this room, the extra light from outdoors is reflected in the mirrors, improving the contrast in the space. If you are going to a green wall, you can extend the color to the linens. The green looks more beautiful on the duvet, and the cream that flows through the dominant green creates a serene environment. 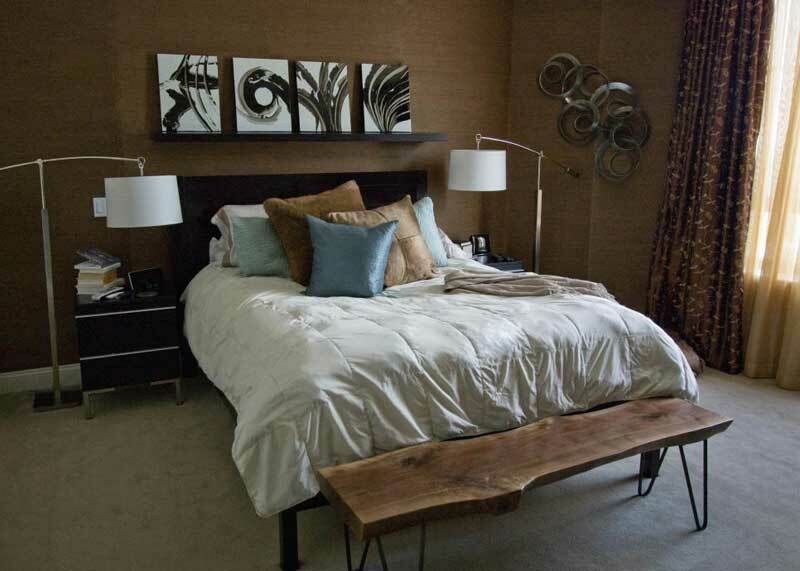 The stylish, colorful room here utilizes brown and beige for an elegant, yet cozy look. 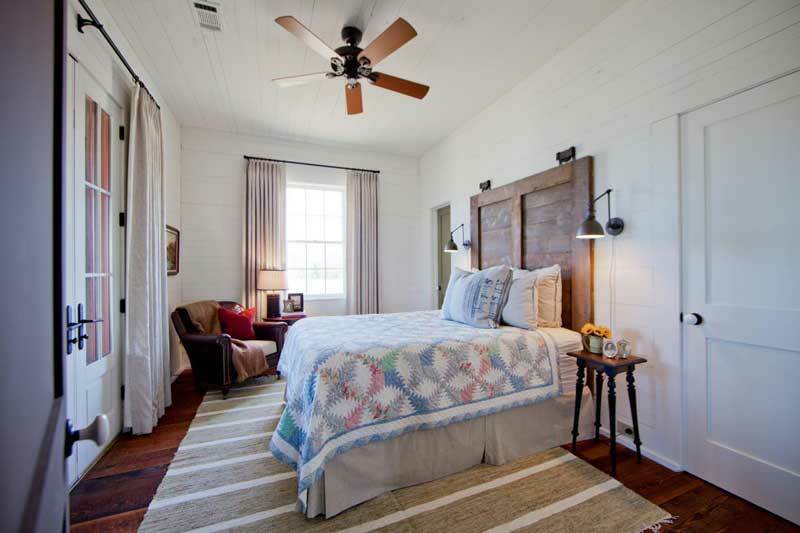 The brown overhead fan and the bedside tables stand out. 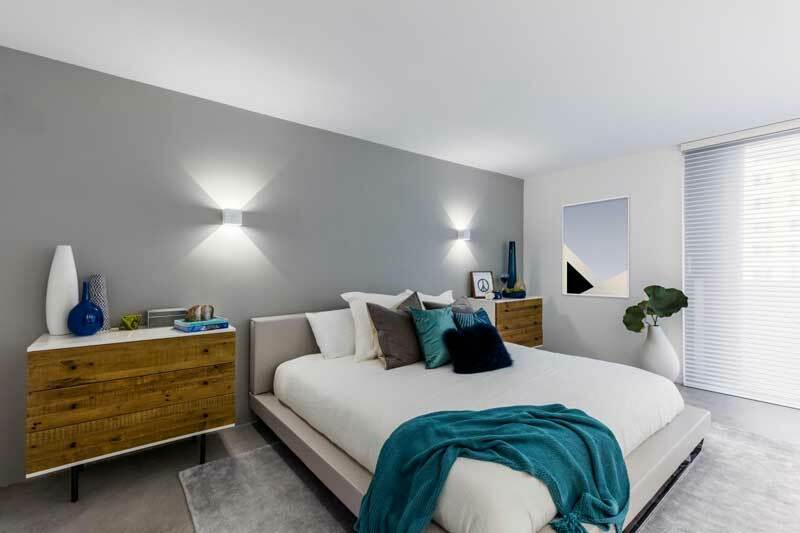 With lots of light coming in from outside, the lamps on the sides of the bed are still able to produce a warm light that not only expresses the essence of the color palette used here but also adds beauty to the décor. The rustic bench in this view is not large, but adds texture and completes the design. Serving as more than just decoration, it is utilitarian and complements the color scheme. 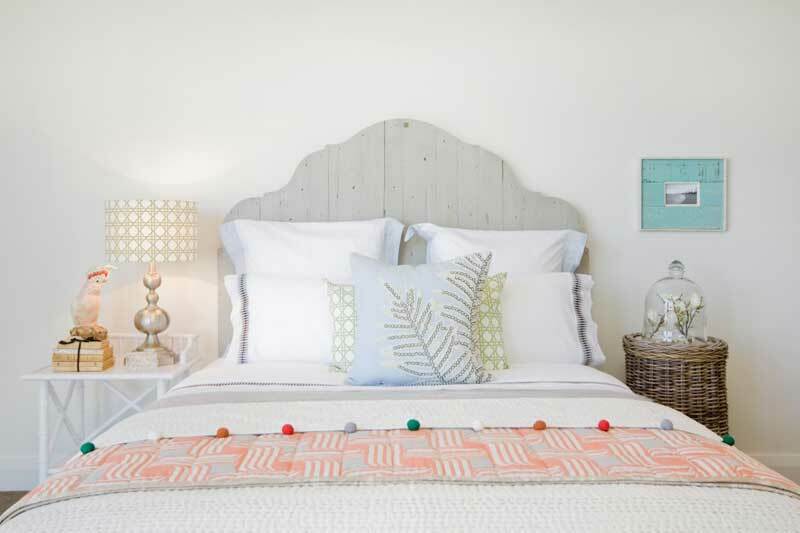 The white lamps on both sides of the bed match the duvet on the bed, while the throw pillows play with different colors to add more color to space. 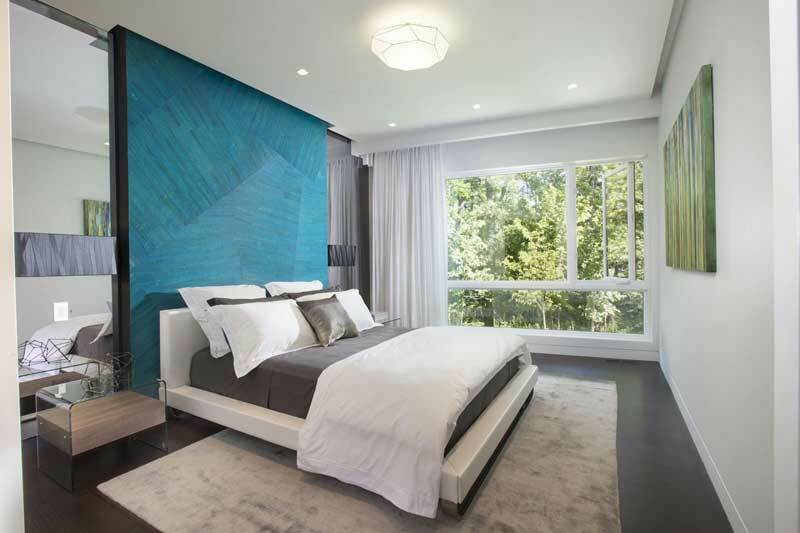 An item that can make or break a bedroom design is the wall accent. If you get it right, the rest of the room will be beautiful. But if you get it wrong, you will not be able to improve the look of your room with other items. 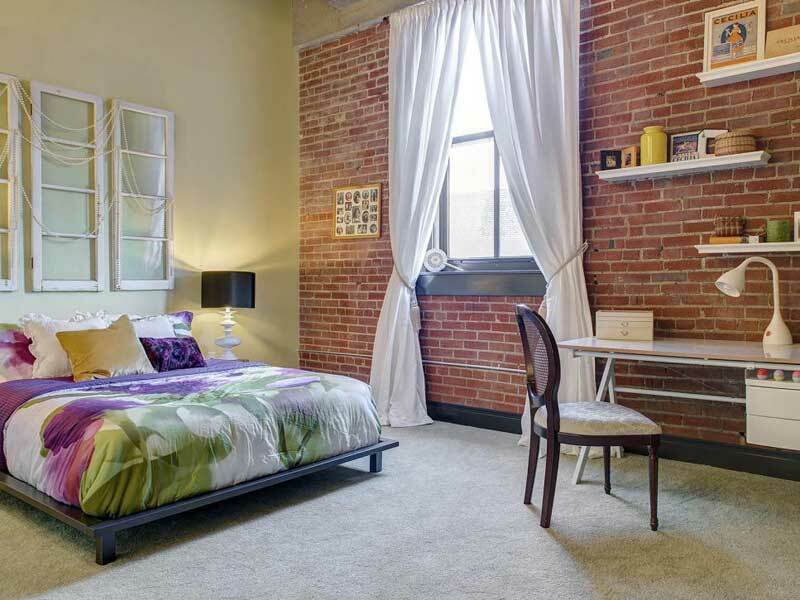 This room successfully utilizes a brick accent, combine it with simple accents. The bright white curtains and large window illuminate the room with natural light. With a golden chandelier illuminating the room, this room is evocative of a mini palace. When you are decorating your room, you need to pay attention to the color of the wall, bedroom furniture, and the accent pillows. You can see how these items are employed to create a coherent color scheme and stunning overall look in this luxurious room. 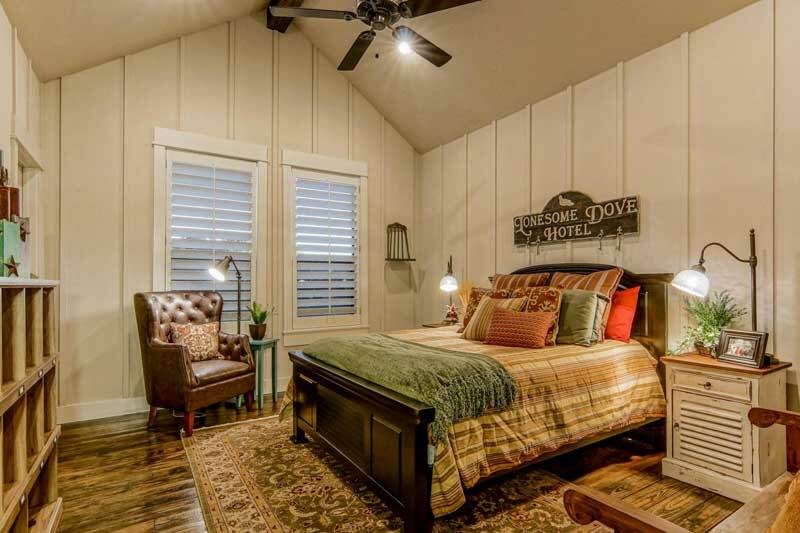 You can break away from the norm and create a master bedroom that is spectacular, yet simple. Elegantly decorated windows in this room provide light from outdoors, but do not overwhelm the rest of the elegant space. The walls are painted light gray, and the furniture is in neutral tones, with wooden and glass elements that are accentuated with touches of gold. There is a lot of light in this setting, which highlights the beauty of the bedroom. There are a lot of ways you can let light in your bedroom. You can use sheer curtains to keep the room bright. You can also use a large chandelier, like the one you see in this picture, to illuminate the room. This masterfully decorated room is both unique and interesting. Combining many different pieces, it nevertheless comes together beautifully. The chandelier is the dominant item here, bringing together the entire design. The mixture of white and black color in this room is abrupt but creates a rhythm that may not be replicated with other color schemes. The wall portraits are in black and white, completing the color palette. With just a few items and some creativity, you can turn your bedroom into a space that has positive energy. 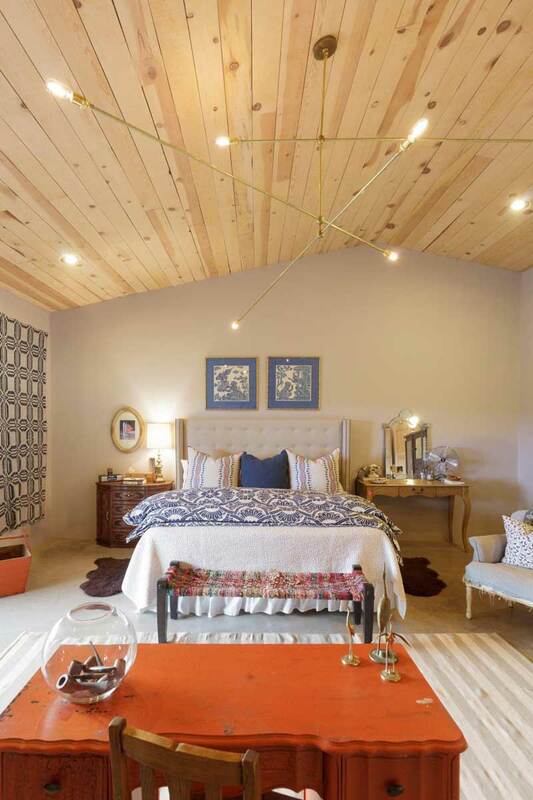 This room is vibrant and lively, with an eye-catching chandelier that matches the wooden ceiling. Many interesting, different elements come together, and the glass doors provide views of the garden outside. Even though there are many objects here, space is not overly crowded. 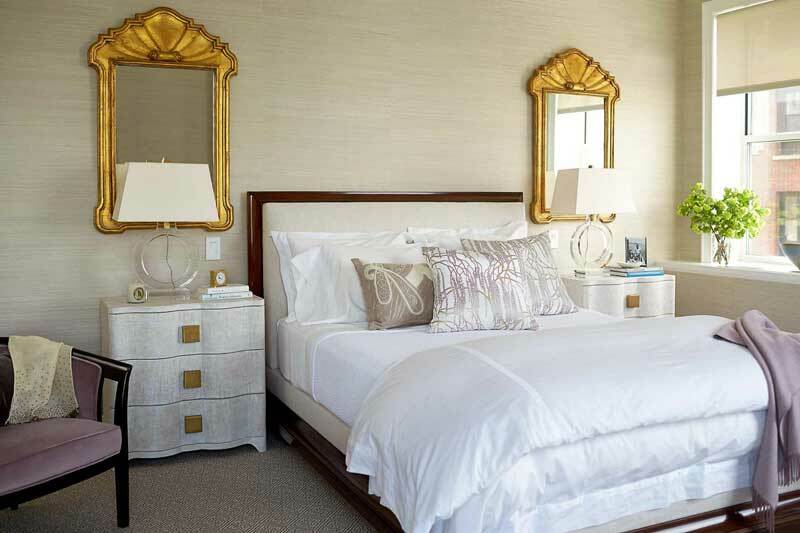 Bring your bedroom to life with golden mirrors and sharp white bed linens. There are two dominant colors here – white and yellow – providing simple, but spectacular, design. When you are decorating your room, you can use just about any item to give your room any expression you want. In this case, the mirrors and lamps are essential elements in the overall design. Blue and white provide a beautiful combination that has long been used for decorating bedrooms. As you can see from this space, these two colors can give your bedroom an elegant look. The wall here has an attractive, eye-catching painting. The window on the right provides bright natural light and a glimpse of the outdoor surrounding. The stunning light fixture matches the rest of the decor. This is a simple interior that is suitable for an individual, but can also comfortably accommodate a couple. The white on the wall matches the two big throw pillows; a smaller, brightly-colored pillow adds variety to the setting. The bedside lamp is dimly lit and helps to improve the texture of the bedding. Unlike many of the designs we have seen on this list, the focus here is on the bedding itself with minimal attention on the surrounding.